Kargo Master van equipment packages are an excellent way to add organization to the back of your van. There designed to complement your exact make and model. 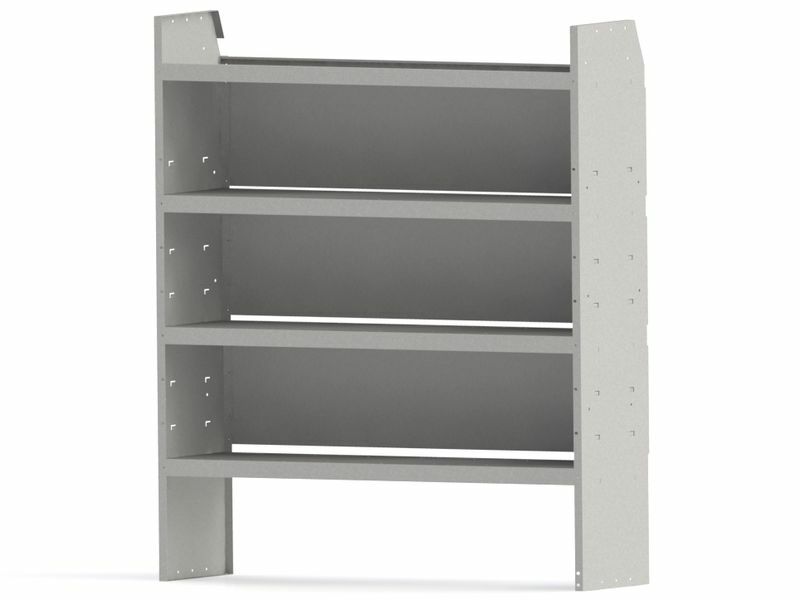 Depending on which package you order, these packages are equipped with a combination of organizational tools including three pronged j-hooks, door kits, lower shelf dividers, upper shelve dividers, plastic bins, steel drawer cabinets, welded shelf units, rotating rear wheel well stands, and van partitions with wing kit. If you use a cargo van for hauling tools and cargo, you can waste a lot of time digging for tools that are lost in the mess. With the Kargo Master van equipment packages, you will have all the organization you need. More organization means less time looking and more time working. What a great combination! Save time and money with the Kargo Master van equipment packages. Please Note: Before taking delivery on a Common Carrier (Truck Freight) shipment, please thoroughly inspect for shipping damage prior to signing for the shipment. If anything appears to have been damaged during transit, we suggest you refuse shipment. After you sign for truck freight shipment it is very difficult to file a ship damage claim and attain reimbursement. LIFTETIME FRAME WARRANTY: If your product cracks, bend, buckles, or structurally fails in any way, Kargo Master, at its option and expense, will either replace or repair the product. EXECPTIONS AND EXCLUSIONS: This warranty does not cover shipping damage, product misuse, improper installation, road hazards, impairment from accidents, overloading above the stated rack capacity. This warranty does not cover the cost of repairs made outside the factory without factory authorization. Any alterations to this product renders these warranties null and void. LIMITED WARRANTY: This frame warranty contains all of the terms of the warranty being provided in connection with Kargo Master products. No person is authorized to make any changes or additions to the terms set forth herein unless they are set forth in writing and signed by an officer of the Company. All other express and implied warranties, including warranties of merchantability and fitness for a particular purpose, are hereby disclaimed. If the Kargo Master product failure is covered by the Frame Warranty, the Company's sole obligation shall be replacement or repair of the Kargo Master product described above. In no event will the company be liable or responsible to the purchaser, employees or agents of the purchaser, family members or other users for any damages other than the cost to replace or repair the Kargo Master product as described above. This limitation applies to damages of any kind, including any direct or indirect damages, lost profits, lost savings, loss of use or cost of capital, physical injury or death, or other special incidental, exemplary, punitive, or consequential damages whether for breach of contract, tort, or otherwise or whether arising out of the use of or the inability to use the Kargo Master product. This warranty is limited: thus the terms and conditions of the warranty should be reviewed and understood before purchasing or installing the Kargo Master product. Kargo Master Return Policy: Kargo Master products that have been installed, used, drilled, bent, scratched or otherwise damaged are no longer in new and ready–to-sell condition and cannot be returned or refunded. Kargo Master Products are fully warranted according to Kargo Masters warranty policy which is generally limited to repair or replacement based on Kargo Master discretion. Returned merchandise must be in new (with the original packaging) and ready-to-sell condition. If returning a Kargo Master product, it will be the customer’s responsibility to pay the return shipping and if not in new condition a credit will not be issued. . (This is Kargo Masters Policy). As always, if RealTruck makes an error we would cover the return fees and replacement costs.